My family went on a dolphin cruise today and we loved it! I had been on a fishing trip with Voyager earlier this summer with some friends and it was great, so when we took our family vacation, my wife and kids wanted to go out on a boat while we were here. The cruise was very relaxing and captain Brian Davis provided a nice narration of local history as we passed by little fishing towns and marinas, plus he also revealed some hidden gems along the way that we would have never discovered on our own! There were no dolphins today, but I can’t blame the captain for wild animals not showing right on cue. The crew, Andrew and Tyler were attentive and helpful, although at one point they were busy dropping a net off the back and could not help passengers who wanted drinks. The net was all part of the cruise and people just have to wait. The crew pulled up some sea life and everyone got a chance to hold a small stingray. My 2 kids were really impressed. Andrew was great with my kids as he showed them the stingray. The captain continued in his best attempt to find dolphins but they didn’t show. We were out in the ocean for about 30-40 minutes, but it seemed longer. One thing we liked about this boat, compared to other dolphin boats is how we could walk all around the boat during the trip, and it has an inside cabin with comfortable benches and tables to sit at. We didn’t have any trouble getting snacks or drinks. 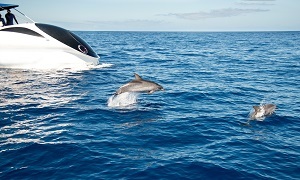 Overall, it was a very enjoyable trip, despite not seeing dolphins, and worth the money. Captain Brian and his crew made it a trip to remember. We will definitely be back next year to do it again! We went on the dolphin boat tour a week ago and loved it! My daughter is about to turn 5 and it was her first boat ride. The crew was AMAZING and even sang Happy Birthday to our daughter! We were able to see a dolphin, baby shark, squid and a puffer fish. The crew let our daughter touch and hold the squid and the fish. This will for sure be something we do every year when we go on vacation! Thank you for the great experience!!! We would love to see your review online. Check us out on Facebook, Google or TripAdvisor.